Claude Monet, Bathers at la Grenouillère (detail) (1869), oil on canvas, 73 x 92 cm, The National Gallery, London. WikiArt. Having established that my new method for examining the palette used in paintings should be capable of yielding meaningful results, here they are, displayed on the polar charts explained in the last article. This polar chart shows the pooled results from 8 paintings (128 measurements) dated to between 1400 and 1700, which have been shown in previous articles in this series. Inevitably, they are predominantly earths, with some reds, with hues between 350˚ and 50˚, although many do attain high levels of saturation. Other hues represented are a turquoise blue of around 180˚, which may represent azurite and its relatives, and the almost signature 240˚ blue indicative of ultramarine. Other colours, notably greens, are of low frequency and low saturation. This chart shows the pooled results from 10 paintings (160 measurements) dating from 1700 to 1850 (with one, Courbet’s The Painter’s Studio, actually from 1855), again all shown in previous articles. At first sight it may not appear that different from the chart above. However looking at it more carefully the earlier cluster of around 240˚ (ultramarine) has been replaced by one at 210˚, which probably represents the extensive use of Prussian blue from about 1720 onwards. There are also more greens from 75˚ to 165˚, with higher saturations, which should represent ‘Prussian green’ (a mixture of Prussian blue and yellow ochre), and the use of synthetic copper arsenites from 1778 onwards. This third chart shows the pooled results from 14 paintings (224 measurements) dating from 1850 to 1938, as shown in previous articles. The distribution of points has changed markedly. Although the range of earths and reds between 350˚ and 50˚ persists, they attain even higher levels of saturation, and continue through pure yellow (60˚) to yellow-green at around 90˚. This is probably the result of the use of better madder lake derivatives including alizarin crimson, and the modern yellows, particularly chrome yellow, respectively. Blues used now extend from 210˚ (probably Prussian blue still) to 250˚, which is likely to include synthetic ultramarine, and cobalt blue. 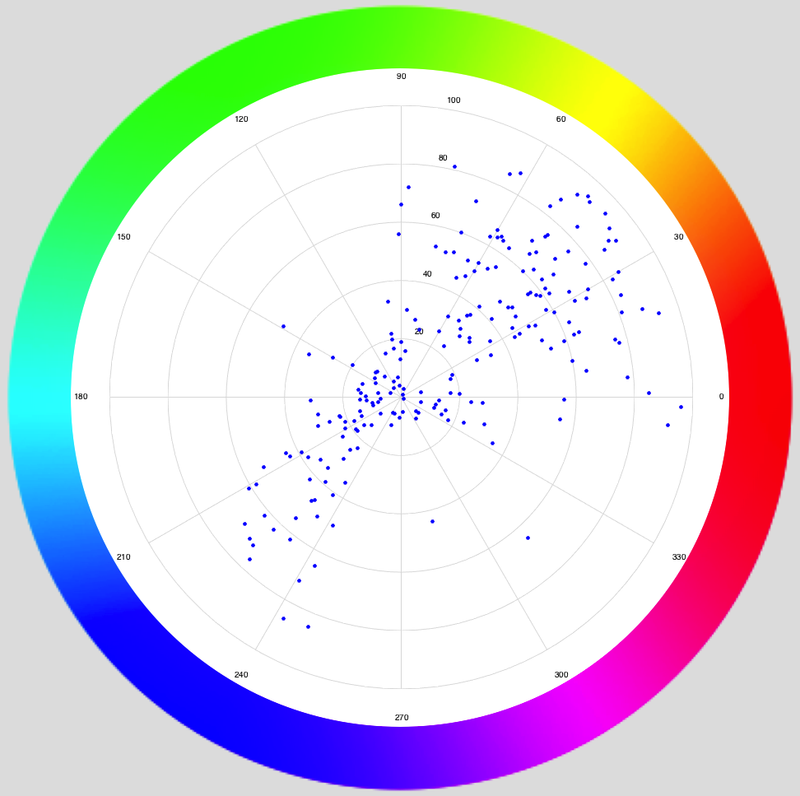 Cerulean blue could account for some of the points towards 180˚. Greens are much more extensive, with some attaining higher saturations too. The peak at around 150˚ is probably the result of emerald green, and some of the lower saturation greens may represent the use of chrome oxides. There are also some high-saturation colours appearing in other hues, such as the purples/violets. An alternative approach to visualising the changes is to turn the time sequence of polar charts for individual paintings into a movie, which I provide above. In that you will see paintings which appear almost monochromatic, those consisting of earths and one blue (dichromatic), but it is not until those from the latter half of the nineteenth century that palettes appear to be spread wide across the modern range of hues. None of this evidence shows that paintings in the latter half of the nineteenth century became more ‘colourful’ as a result of the introduction of new pigments. It is clear that, in spite of new pigments, some artists like Bouguereau continued to use traditional palettes which were more typical of those used more than 200 years previously: that clearly was an artistic choice. However Rembrandt’s decision to use the pigments which he did, with a palette dominated by earths, was not so much choice as limitation. Similarly, in the hypothetical situation that modern pigments had not been introduced when the other factors which led to Impressionism had occurred, it is inconceivable that Impressionist style would have developed in the way that it did. I therefore propose that the availability and use of modern pigments, and evolution to more direct painting methods, were major factors in determining painting styles in the latter half of the nineteenth century, particularly those of the Impressionists. I do not think that we can continue to ignore that. Posted in Painting and tagged Bouguereau, Callen, chroma, hue, Impressionism, painting, palette, pigments, polar chart, Rembrandt, saturation, style. Bookmark the permalink. Who to believe on ‘ad-blockers’?